After you have downloaded and opened up the software, you will go to the settings menu in the bottom right hand corner of the stream. In the Settings menu, you will go to the section on the left that says Stream. This is where you will put in your information from your Stream Monkey stream. Go to your Stream Monkey dashboard, and click on the Details button on your stream for this information. Enter the following information in these fields. Username and Password will be your stream's username and password, not your Stream Monkey login. Next you will go to the Output stream. You'll basically want to match the screen you see above, though you can adjust the bitrate if you need to. Higher bitrates will need more CPU and bandwidth for a clear stream. Pay special attention to the Keyframe interval, Profile, and encoder x264. 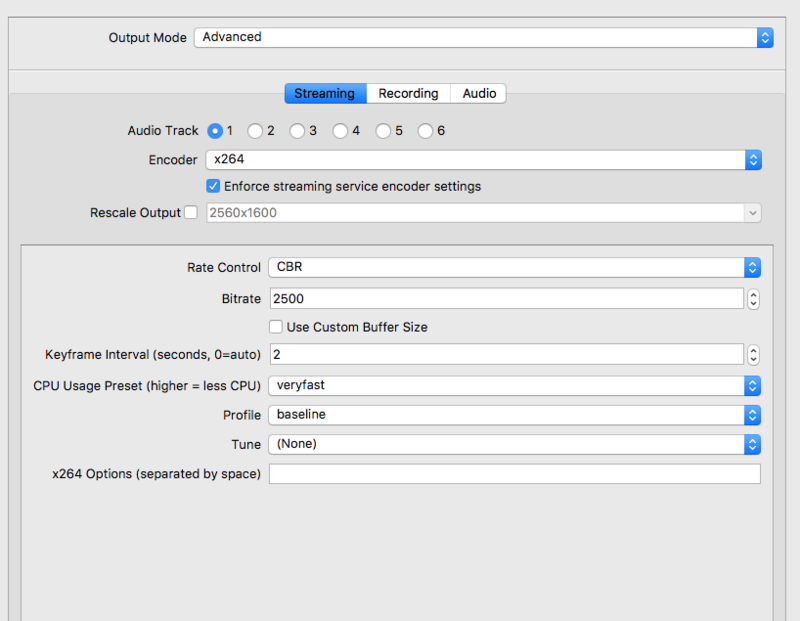 You can also adjust the Audio Bitrate if you'd like, though it's default setting is just fine. Once you're all done getting set up, hit Start Streaming. Pay special attention to the stats at the bottom of the screen to see how your stream is doing. Here you can see if you are Dropping Frames, how long your Live Stream and Recording have been running, and your CPU usage and fps. This is important information to know, especially if you are having issues. After your stream gets going, you can go to the place you have it embedded, or take a quick glance at the Preview window on your stream to make sure it's getting to where it needs to go. That's all there is to it! Having problems getting set up, or have a quick question? Feel free to reach out to us for help!